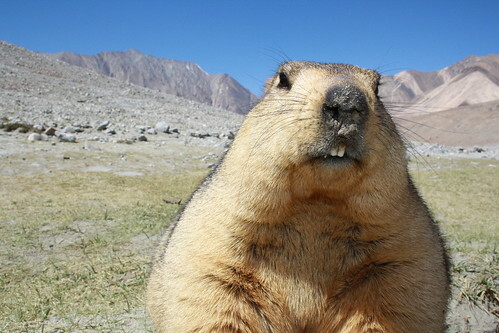 Close Up Marmot, a photo by saish746 on Flickr. We left early for Asia’s longest lake and most beautiful lake among all. We reached Changla Pass through a narrow and tough road from Leh. It is the third highest pass in the world at height of 5289m. There is a army tea canteen which provides all the travellers Black tea and dry fruits at no cost. Beyond Changla another breath taking valley opens up along with some greenery where you can see Wild Himalayan Horses, Ibexes, Tibetan Antelopes, Himalayan Wolves, Black necked Cranes and our own favourite Himalayan Marmot (Phiya in local language). This fat rat, size of a small dog, from squirrel family was fearless and friendly. I game him my partner’s parantha and chocolates. We stayed some quality time with him in his wild while returning.